Sudan has expelled a foreign journalist for reporting on the country's Darfur crisis and arms industry, U.S. diplomats said on Monday. "The U.S. embassy in Khartoum condemns this expulsion and continues to deplore infringements by the Government of Sudan upon freedom of the press and expression," the embassy said in a statement. No one was immediately available for comment from Sudan's government or security service. Aly reported on a series of clashes between government forces and rebel fighters in Sudan's Darfur region. Foreign journalists receive permits to visit the remote western region, but have faced restrictions on their movements once they arrive. The US embassy in Khartoum has condemned the recent expulsion of a foreign journalist from Sudan. Heba Aly, a freelance journalist, was expelled on 2nd February, for reporting on the crisis in Darfur and for attempting to investigate Sudan’s arms industry. Heba says that, as the election nears, the National Security Bill and the Press Bill have to be passed to allow for free and fair elections. The international press freedom watchdog, Reporters Without Borders and the Canadian government are both to investigate her case. 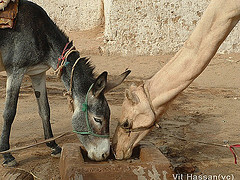 Thanks to Eric for posting a link to Heba Aly's blog - Heba's adventures in Senegal ... and beyond! - here in the comments. Aly told colleagues that she had been questioned by Sudanese authorities in December when she left Khartoum to spend Christmas with her family in Canada. She returned to the East African nation in January but did not obtain a new press identification card from Sudanese authorities and her application for a work permit was not approved. Aly worked in the war-battered country throughout January but was given an ultimatum last week to leave. In the case of Heba Aly, a Canadian journalist with Egyptian nationality as well, Sudan says it expelled her because of immigration issues, not because of her reporting. Yet Ms. Aly says it was her investigating of Sudan's arms manufacturing industry that prompted agents from Sudan's national security agency to call her in for a hastily convened meeting this past weekend at a restaurant in Sudan's capital. Heba's personal blog now carries a brief post concerning her expulsion that links to last week's related AFP and CSM stories. Thanks for the useful comment Eric. I hope this finds you well.